This weeks Indie Book of the Week is one that I am so excited to be sharing with you, not only did it completely take me by surprise with how much I truly loved it but it was very well written and I am so sorry I didn't pick it up sooner. I had no idea what I was missing out on! This weeks book is, Gifted: A Donovan Circus Novel by Liz Long! This is the third book I have read that involved a circus of some form or another and really, I don't know why I don't read more of them. I have loved every single one of them. And while they have all been different reads, they have all been just as fabulous and unique as this one was. I really enjoyed the paranormal aspect in this novel. 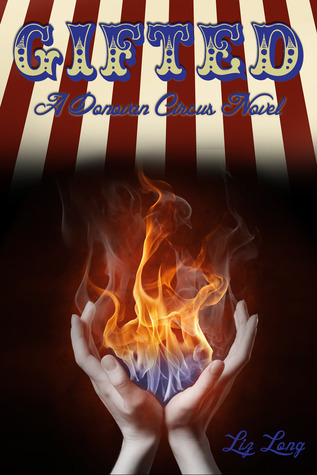 The characters, the family feel of the circus, the mystery behind the deaths, the details. Everything was just very well done. I am so sorry it has taken me so long to get to this one, I really am. The author contacted me months ago (yes, I know, bad reviewer!) and I just now was able to squeeze it in. I really wish I would have started it weeks ago. I had a lot of fun reading it and had a hard time putting it down even. I got completely wrapped up in the storyline. There were some pretty amazing characters, a great storyline, a little romance, a lot of action, lots of gifted people, a crazy scientist and even some mystery thrown in for good measure. We get the feisty good girl, the loveable sweet boy, the great best friend, and we even get a hot bad boy and of course the whole paranormal/fantasy element I love. Really, what more could I ask for? And while there is some language in this and obvious violence this really is a great read that while I wouldn't classify as YA I think an older YA audience would be just fine reading it. Overall I give this one a very solid 4 Stars and I can't wait to read the next installment in the series! Hey don't feel bad about not getting to books sooner, I think most bloggers wre buried. I read another review of this somewhere awhile back and the reviewer gave it a good solid review. Definitely sounds like a good read! It sounds horrible but, I am so glad that I am not the only reviewer out there right now that feel buried under a pile of books LOL! I just feel bad when it takes so long to get to them, especially when they turn out to be fabulous reads like this one! Thanks for stopping by Heidi!! Release Day Blitz: Shallow by Georgia Cates! Second Chance Blog Tour and Book Review! Cover Reveal: Opal by Jennifer Armentrout! Review: Transcend by Christine Fonseca! Indie Book of the Week: Promises by Amber Garr! The Stone Of Darkness Blog Tour and Guest Post! Guest Post: A Bitten Shame Blog Tour! Review: The Wedding Cake Girl by Anne Pfeffer!